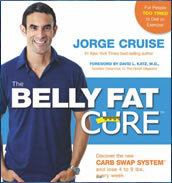 The Belly Fat Cure is written by Jorge Cruise who is also the author of The 3 Hour Diet. In this latest book, which has reached the New York Times bestselling list, Cruise introduces readers to his ‘Carb Swap System’. He promises dieters that they can target their belly fat and lose four to nine pounds a week. The basic concept of the Belly Fat Cure revolves around keeping insulin levels in balance by avoiding all simple sugars, including those from fruit. Cruise states that high insulin levels cause the liver to convert excess sugars into fat that specifically gets stored in the belly. You don’t have to count calories on the Belly Fat Cure diet but instead you pay attention to the types of foods you are eating and follow the ‘Carb Swap System’. The general eating plan is similar to the South Beach Diet and you are allowed to consume 15 grams of sugar and six servings of complex carbohydrates each day. The meal plans are based on proteins, fats and vegetables with small amounts of sweeteners and whole grains. All processed foods and artificial sweeteners must be eliminated. Dieters are encouraged to drink at least eight glasses of water a day. Wine, beer and champagne are acceptable but cocktails, fruit juice and milk are not allowed while on the Belly Fat Cure. The only fruits that can be consumed on the Belly Fat Cure are blackberries and blueberries because they have a very low sugar content. But when you reach your ideal weight you can then include up to two pieces of fruit in your diet each day. Jorge has just released an accelerated version of his diet called the Belly Fat Cure Fast Track. In this version, He says that dieters could expect to lose 14 pounds in the first 14 days of the diet. This version drastically eliminates sugar and focuses on hidden sugars as well. Chicken, turkey, beef, lamb, pork, fish, seafood, eggs, cheese, whole wheat bread, whole wheat pasta, brown rice, oatmeal, walnuts, almonds, pecans, avocado, olive oil, vegetables, blueberries, blackberries, sugar free chocolate chips, sugar free maple syrup, xylitol, stevia. The Belly Fat Cure states that you don’t have to exercise to lose weight but exercise does provide benefits for reducing stress and improving strength. Walking for 20 minutes each day and performing an eight-minute abdominal workout is encouraged however this is entirely optional. The Belly Fat Cure: Discover the New Carb Swap System and Lose 4 to 9 lbs. Every Week retails at $19.95. Encourages the intake of whole grains and vegetables. Will appeal to dieters specifically interested in addressing belly fat. Includes a detailed food list with sugar and carbohydrate information. Includes recipes and a meal plan. Meal plan is high in saturated fat. Does not allow fruit except for certain berries. Some of the recommended food items may be expensive or difficult to find. Weight loss expectations exceed those advised for good health. Many of the claims made in The Belly Fat Cure are exaggerated – such as “results are almost instant” – and this can set dieters up for unrealistic expectations. It is possible that a weight loss of four to nine pounds may occur in the first week but it is highly unlikely – in addition to being unhealthy – for such rapid results to continue. In terms of the dietary recommendations the Belly Fat Cure is very similar to many other reduced carbohydrate diets. Most dieters will probably experience some weight loss initially, however for this to be maintained it will probably be necessary to pay attention to caloric intake and to incorporate regular exercise into the program. Cruise, J. (2009). The Belly Fat Cure: Discover the New Carb Swap System and Lose 4 to 9 Lbs. Every Week. Hay House, Inc.